Welcome to the Missionary Brazil page - where you can meet a missionary in Brazil, and get a close look without leaving home. 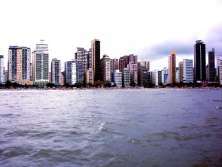 Rain forests, carnival, music, parrots, cities - what comes to your mind when you think of Brazil? To be a missionary in Brazil, you don't have to be a blogger. But apparently it helps. Of all the missionary blogs I read, I don't think any country dominates quite like Brazil! But of course, Brazil is not only the 5th largest country in the world in size, it's also the 5th largest in population. No wonder it leaves a big footprint in the missionary blog landscape. And at least two that I know of have been blogging since 2003 - veterans in the world of missionary blogs! First, visit Quirey Life to read about the adventures of Valerie and Russell. Although they don't post as much anymore, there are still many years of posts for you to enjoy. Arguably one of the most popular Brazil blogs is Comings Communiqué. Dating back to the summer of 2003, Andrew Comings has typed his blogs, video taped his blogs - he's even blogged by phone! Andrew's wife, Itacyara, is Brazilian herself. The unique, insightful and often humorous blog entries keep many of us coming back for more. A little newer but still a veteran is jewellpage, a blog started in 2005. Mike and Dawn serve with Brazilians to reach Brazil. Finally, don't miss Bud Simon, a Brazil missionary blog started in the same year. There are lots of fun posts, plus pictures and other resources at his blog. Be sure to stop by and get to know James and Christen and their family at The Taylors Magnifying Christ in Brazil. Their blog always very informative through great pictures, video and news updates. They've been blogging since September 2006. Finally, just one more, although there are many more I could mention. Our last missionary Brazil blog - The Nunleys in Brazil from veteran missionaries who started blogging in 2010. Here you'll find lots of pictures of their life and ministry. 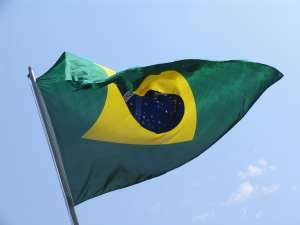 The banner on the Brazilian flag reads Ordem e Progresso, which is, in English, Order and Progress.